Welcome to Asian Market and Cafe of Port Charlotte, Florida. We are your destination for traditional, authentic Thai food and Asian Fusion Cuisine in Port Charlotte, FL. 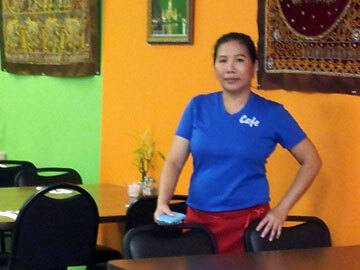 Come and enjoy delicious Thai food dishes for lunch or dinner in our casual, cozy, comfortable cafe. We are open from 11:00 AM to 9:00 PM with easy parking. Find out for yourself why we are among the Best Rated Restaurants in Port Charlotte on Trip Advisor and why our customer's Google Reviews are among the highest in Charlotte County! Delivery is available Tuesday through Sunday - local & downtown Port Charlotte area. $30 Minimum. $3 Delivery Charge. Asian Market & Cafe Has Been Remodeled! We want to thank you for your patience while we renovated to add dinning space. Our growing number of regular weekly customers as well as new fans can now enjoy an even better dining experience! We look forward to seeing you soon! We also offer catering and special events! Asian Market & Cafe has Employment Opportunities! What started out as a great place to pick up Thai and Asian groceries has now become THE destination for authentic Thai and Asian food in Charlotte County FL. Southwest Florida residents are coming from all over the area to find out what the local buzz is all about. From Fort Myers to Englewood, they keep coming back for the bold flavors and unique experience found at the Asian Market and Cafe. Come and join us in a comfortable casual atmosphere where the Thai food is as good as it gets. Guests are often raving that it's as good as the food they had while travelling in Thailand. That's no wonder since the Owner and cook Nan has lived and trained in Thailand. The dining experience is enhanced by the staff's timely and friendly service. Whatever the occasion, you will find the dinning experience a pleasure. Whether it's a night out on the town, a business lunch meeting, a family fun trip or a bunch of friends just hanging out, everyone will have a great time! Anyone looking for a Thai food restaurant in Port Charlotte, Punta Gorda, North Port or beyond will surely find the trip worthwhile.